The perfect Guacamole Recipe – creamy, a little chunky with lots of lime. Perfect for camping snacks, happy hour or with tacos. In my life, Avocados rule all. 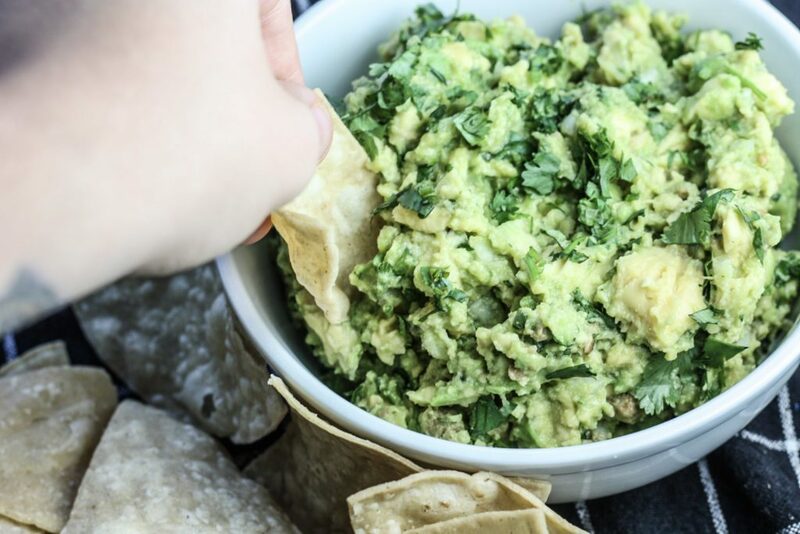 So Guacamole is a campsite classic: perfect for camp snacks or happy hour, great on top of proteins right off the grill and obviously an excellent accompaniment to tacos. There are a few tips you should know about to create the ultimate Guacamole. It’s something simple so every element needs to be perfect. Because Avocado is so fatty and creamy, you need something to help cut some of that. That’s where salt comes in. Avocado is relatively bland on it’s own so adding salt really helps add some flavor. Don’t be afraid to get limey. Much like the salt, the lime helps cut all that richness and it brings you bright, refreshing flavors. So make sure you’re using enough lime juice! If you’re finding your guacamole bland, chances are all you need to do is add more salt or lime juice. Pro tip: When I make Guacamole at home, I usually add garlic that I grate with a microplane zester. This imparts garlic flavor without crunching into a big, raw bite of garlic that can sometimes ruin the eating experience. It’s not likely that many people bring a microplane zester camping (but if you do, more power to you and props! ), so in this case I would suggest using garlic powder (or omitting altogether) to make it easier. Now go forward and eat Guac & Prosper. Peel skin and remove pit of Avocado. In a bowl, mash Avocado, leaving it slightly chunky. Add in onion, jalapeño and cilantro. Add garlic powder, if using. Add juice of lime. Season generously with salt. Mix together. Serve! Don't skimp on the salt or lime juice! It makes it. If you're going to serve this guacamole on tacos or nachos or something where you'll also have chopped cilantro, you can easily omit it in the guac. The recipe for Guacamole appeared first on Mince Republic.